It’s back! Rejoice, rejoice! After settling for Strictly and tolerating The Voice, the best talent show on British TV is back! Yes, that’s right, Britain’s Got Talent is back for a 13th (yes, thirteenth) series. There is so much to look forward to! Ant and Dec are reunited! All four judges are back for another season! And most importantly there is the contestants, who come from all walks of life and offer all sorts of weird, wonderful and amazing talents. It will be a staple of the ITV schedules in the UK for many weeks to come. But if you are outside the UK, you will find it difficult to watch. That’s what this article is all about. Keep on reading and you will find out how you can make sure you don’t miss a single episode of the addictive Britain’s Got Talent. We’ve done the leg work so all you have to do is sit back and enjoy the show! Ok, let’s get the dull bit over with. What exactly do you need to do to watch Britain’s Got Talent 2019 from abroad? I expect you are worrying at this point that we are going to point you towards some dodgy online stream or start to get highly technical about something or other. Chill out! Watching Britain’s Got Talent 2019 from abroad is actually ridiculously easy. Why? Well, because as well as broadcasting the show on TV, ITV also stream it live and on-demand through their ITV Hub streaming platform. It’s not quite that simple because they do block people from outside the UK from accessing this service. But there is a really simple solution to this. All you need is a VPN app. Oh, and a device like a smartphone, tablet, or laptop that is connected to the internet. That’s it. Nothing more. Just those two things. What is a VPN and where do I get one? If you’ve never heard of a VPN before, don’t worry. A VPN is a simple app that enables you to trick streaming services like ITV Hub into letting you watch their shows even if you are not in the right country. By using a VPN, you can watch Britain’s Got Talent 2019 live or on-demand from Spain, France, Australia, the USA, Hong Kong… anywhere in fact. If you rush off now and Google the term VPN, you will hit with hundreds of results with dozens of different VPNs all claiming to be the best in the business. Most of these claims are tenuous at best. Our job is to test VPNs to see which is the best for different jobs and our tests show that ExpressVPN is the top VPN for watching shows on the ITV Hub abroad. Why? Well, it’s cheap thanks to our exclusive 49% discount of an annual pass, it’s easy to set up and use, and most importantly it works! There are some other VPNs that work too, of course and below is a rundown of our top three. Make no mistake, ExpressVPN is head and shoulders above the rest but you’re free to choose. First, you will need to subscribe to a VPN. You can do this by clicking one of the links on the page. 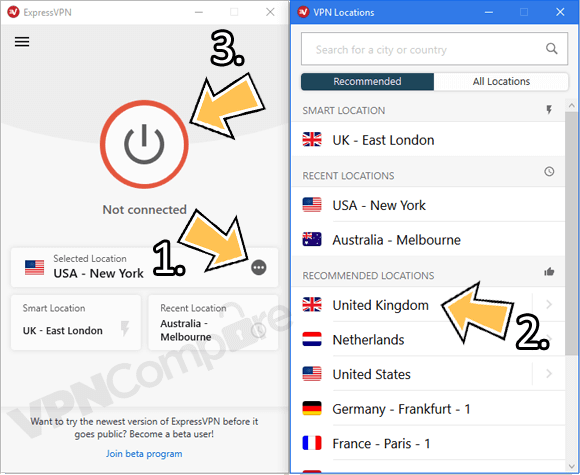 We will be using ExpressVPN to watch while we are abroad, so that’s the one we have used in this example. If you choose a different one, the process will still be much the same. After signing up, you will need to download the VPN app. This can be done on their website. In the case of ExpressVPN, just head to the Products tab on their homepage. If you are downloading onto a smartphone or tablet, the simplest thing to do is to head to your usual app store and then search for the name of your VPN provider. To watch shows on ITV Hub, you will need to be connected to a UK-based server. This is how ExpressVPN fools ITV Hub into letting you watch even if you are abroad. To do this, Press ‘Choose Location’  (or the ‘…’ on a mobile). Then select ‘United Kingdom’ . If you’re using a computer you’ll need to press ‘Connect’ . If you’re using a phone or tablet, it will connect for you. 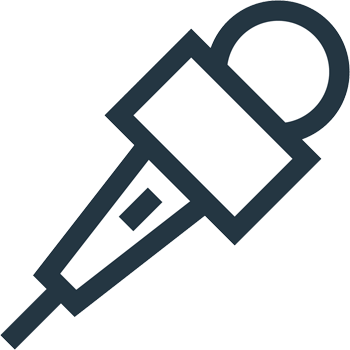 Watch BGT 2019 using ExpressVPN. Now, all you have to do is open up ITV Hub, log-in or create an account (if asked) and then find the latest Britain’s Got Talent episode. You can also watch live if you tune in at the time it’s showing in the UK. You can now sit back, relax, and enjoy what promises to be another brilliant series. When is Britain’s Got Talent 2019 on? The new series of Britain’s Got Talent began on Saturday, 6th April on ITV at 7:15 pm. That is British Summer Time (BST) so if you are abroad, check the times to make sure you don’t miss out if you want to watch live. If you want to watch the companion show, Britain’s Got More Talent, you can enjoy that too. It’s shown on the same night on ITV2 at 9.25 pm and will also be available on the ITV Hub. Are Ant and Dec back? Last year, Declan Donnelly presented much of the series alone as his on-screen partner Ant McPartlin took time out to deal with his well publicised personal issues. Dec did a terrific job but, let’s be honest it wasn’t the same without Ant. Well, the good news is Ant is back and raring to go for this latest series and Britain’s most popular TV presenting duo will be reunited once again! Who is on the judging panel this year? While other talent shows change their judging panel, Britain’s Got Talent has a tried and tested judging panel that has stayed together for years. And the good is that Amanda Holden, Alesha Dixon, and David Walliams will be joining Simon Cowell on the panel once again this year. David Walliams has hinted this could be his final series but nothing has been confirmed yet so we can still enjoy the magically chemistry between Britain’s four best judges at least one more time. Which contestants should we look out for? Details about who is taking part in the new series of Britain’s Got Talent has been kept closely under wraps, but we do have some information about one act which received a Golden Buzzer, which puts them straight into the semi-finals. David Walliams pressed his in Manchester after being wowed by the Flakefleet Children’s Choir’s energetic rendition of Queen song Don’t Stop Me Now! The other recipients have been kept a closely guarded secret but are thought to come early in the season, so make sure you don’t miss a single moment of the show! 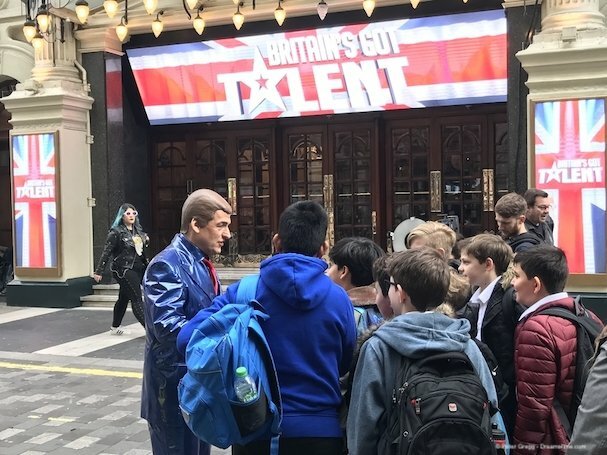 Britain’s Got Talent 2019 promises to be a barnstorming blast of all-singing, all-dancing, all-laughing fun! You won’t want to miss a moment and fortunately you don’t have to, even if you are abroad. You can watch the whole series live on the ITV Hub from anywhere in the world with the help of a VPN. We recommend ExpressVPN as the best VPN for the job. In this article, we have explained how to sign up, download the VPN app or watch on their website, and tune in. There’s no excuses and we will be using ExpressVPN to watch every moment of our favourite TV talent show! Ready to watch BGT? Try our recommended VPN service provider.